Introduction: Welcome to Rio de Janeiro! The exotic mix of beach and mountains, colonial neighborhoods and modern style, together with the vibrant sound of Samba everywhere, are the reasons this city is described as one of the most beautiful cities in the world. Afternoon: Upon arrival in Río you will be met at the airport and have a transfer to your hotel and have the rest of the day to relax or explore the areas around the town. In the evening return to your hotel for a delicious welcome dinner and relaxing evening before you start your adventures your next day. Breakfast: Enjoy a delicious breakfast at your hotel. Morning: After a delicious breakfast at the hotel, we will start our busy day full of adventure! Our first stop is Corcovado. Corcovado is among the 'musts' of any visit to Rio. The 709m humpbacked Corcovado is famous for the majestic statue of Christ the Redeemer located at the top. The Corcovado Hill, together with D. Martha Belvedere, is a mandatory tour in Rio for the beauty of the sightseeing from both locations. From the Corcovado, we can see the beaches of Copacabana, Ipanema & Leblon, the Rodrigo Freitas Lagoon and the Botanical Garden. From the D. Marta belvedere, the main attractions are the Maracana stadium, the Guanabara Bay and the Sugar Loaf. Lunch: Enjoy lunch at a local restaurant before we continue to explore more of Rio. Afternoon: After a delicious lunch we will continue on with a visit to Tijuca Forest. Walk in a forest trail up to the Cascatinha Falls and take in the breathtaking views. We will return to the hotel and have the remainder of the day to explore. Dinner: Enjoy a delicious dinner at the hotel or at a local restaurant. Breakfast: Eat a delicious breakfast at your hotel. Morning: We will embark on a full day exploring more of Rio De Janeiro today. Today we will be picked up from our hotel to enjoy the other side of wonderful Rio. The tour begins with a city panoramic view through downtown Rio, passing by the Sambodrome and the Metropolitan Cathedral, in pyramid form, with internal diameter of 96 meters and height of 80 meters. Get to know the traditional Cinelândia square with historical buildings, the Municipal Theater, the National Library and the National Museum of Fine Arts. By taking the Aterro do Flamengo, we will be taken to the neighborhood of Urca where the Sugar Loaf is located, one of the largest symbols of the city. This visit is made in two steps by cable car. The first cable car takes passengers to Urca Hill, which is 215 meters high and from where one can have a beautiful view from the Guanabara Bay and its islands, the Rio-Niterói bridge and Corcovado hill. From this stage, a second cable car will be taken up to the top with 395 meters to find a splendid view from Copacabana beach, the Santa Cruz fortress and some beaches of Niterói. We will spend the rest of the afternoon at leisure, soaking in the sun's rays at the beach or relaxing poolside at the hotel. Lunch: We will enjoy a delicious lunch, sampling local cuisine at an authentic restaurant in Rio. Afternoon: In the late afternoon return back to the hotel. We will spend the rest of the afternoon at leisure, soaking in the sun's rays at the beach or relaxing poolside at the hotel. Breakfast: Enjoy one last delicious buffet breakfast at your hotel before preparing for our next destination, Iguazu Falls. Morning: After breakfast at your hotel, pack your bags, checkout, and arrive at the designated lobby meeting place for your morning departure to the Rio De Janeiro International Airport with your driver. Afternoon: Upon arrival in Foz de Iguazu, we will be transferred to our hotel in Puerto Iguazu. This little and relaxing town is the gate to visit the impressive Iguazu Falls, (which have been recently declared as one of the New Seven Natural Wonders! ), making them a must see destination. Our local hiking guide will meet us upon arrival at our hotel to provide a map and a brief welcome orientation of the area. Evening: In the evening, we will come together for a delicious dinner at a local restaurant in Puerto Iguazu. Breakfast: Enjoy a delicious breakfast at the hotel. Morning: After breakfast we will depart on a full day tour to the Argentine side of the Iguazu Falls where we will have intimate views of this unforgettable section of the Iguazu River. An experienced guide will show us the hidden gems of this unique National Park and will take us off the beaten path to show us the best views. Lower and upper walkways permit up close and personal experiences with this magnificent spectacle of nature. Trails through the 210 square mile reserve provide visitors with various views of the Falls, especially the largest one, Devil's Throat. The ecological train ride is included in the tour. Lunch: Grab a picnic lunch as we continue exploring the falls. Afternoon: Enjoy free time in the afternoon to take a boat ride out to truly experience the falls or continue exploring the many trails. This day will be a real adventure, full of thrills and spills, and is an absolute must for the adventurer at heart. Morning: After breakfast we will depart on a tour to the Brazilian side of the Iguazu Falls where we will enjoy vast panoramic views of the Falls allowing us to take them in their entirety. Afternoon: Enjoy free time in the afternoon to continue exploring the many trails. We will spend the afternoon exploring the trails and the beauty of this region. After a wonderful day we will make our way back to our hotel and relax back at our hotel. Breakfast: Enjoy one last breakfast at your beautiful hotel. 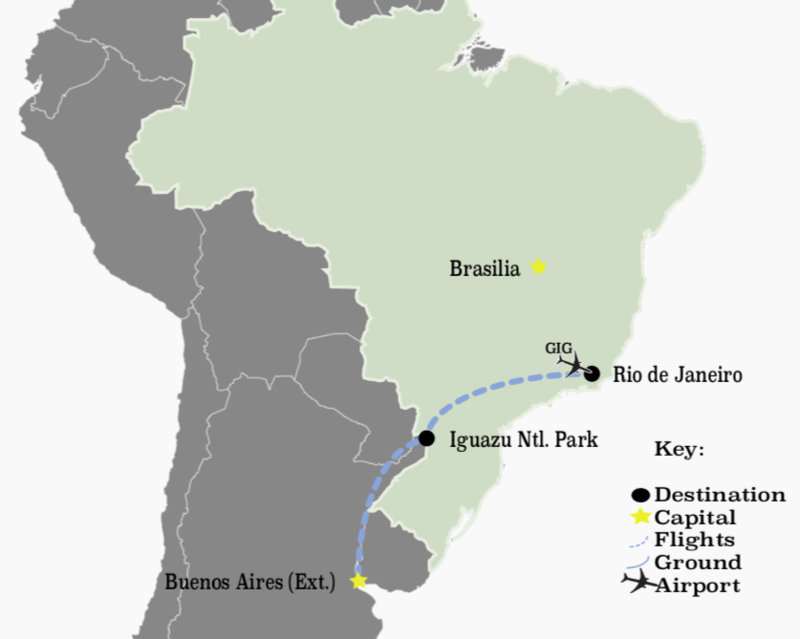 Morning: After breakfast, pack your bags, checkout, and arrive promptly at the designated lobby meeting place for your morning departure to the Cataratas del Iguazu International Airport with your driver, in time to catch your international flights back home! Or, if you are not ready for your adventure to come to an end, continue on to Buenos Aires for our 4-day Extension! Welcome to Argentina! The Capital of Argentina and described as the Paris of South America, Buenos Aires proudly embraces this title, as well as shows off plenty of its own culture! Explore the traditional European architecture, the cobbled streets lined with rustic outdoor cafes, the local antique and artisanal markets that offer plenty of bargain shopping, and the mouthwatering aroma of prized Argentine beef sizzling on an open “parrrilla” (barbeque) in the air. Buenos Aires is home to some excellent local designers and you will certainly find the perfect leather jacket, long leather boots and handbags for all occasions. Though above all, Buenos Aires is known as the home of the tango. Be sure to enjoy a traditional dinner-tango show and explore the colorful San Telmo and Recoleta neighborhoods.